Carrot harvest: 4 lb (sown Nov. 25, 2016). These were ready to pick at least a month ago. They were still good, only a couple carrots had become too tough for consumption (their stalks were about to flower). I started seeds throughout March and April. Seeds that have yet to germinate and young seedlings are housed in the Gatorade bottle cloches (which act as mini greenhouses and protect seeds from the birds). The plan is to eventually have raised beds, but this piece of land is currently an unlevel patch of tough lawn. So I’ve instituted a no-till gardening approach to make the ground more workable, which will make it easier to level out the dirt and install raised beds on top. What I’ve done is sort of like lasagna gardening, just with way less layers. 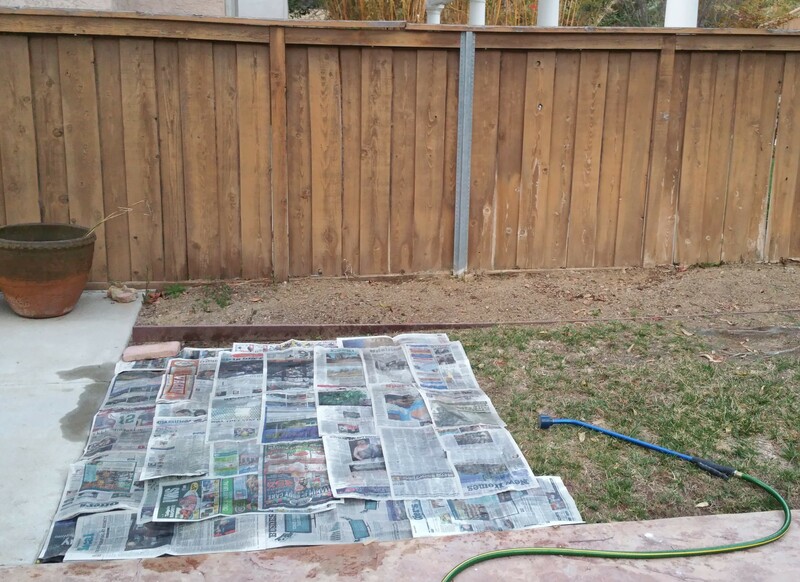 I first covered the grass with a layer of wet newspaper. Next, I layered wet cardboard on top of the newspaper. 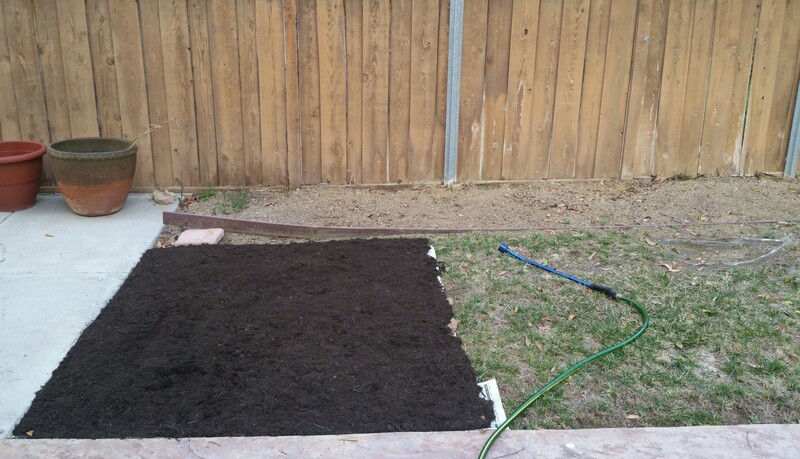 I finished the foundation with a layer of compost (which I got a nice free load of from Miramar Greenery). It looks like I have a freshly tilled garden plot. 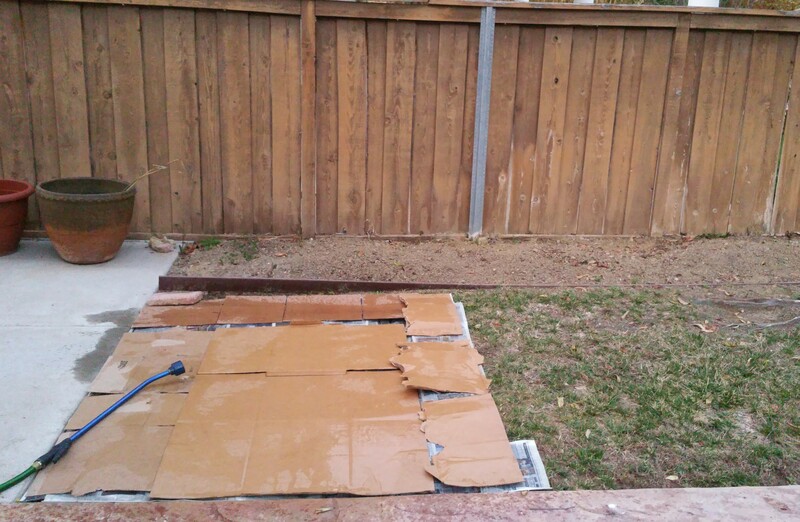 The layers of newspaper, cardboard and compost will block sunlight to the grass, which will gradually decompose underneath (along with the newspaper and cardboard). The decaying organic matter should attract some earthworms, which will help enrich the yard dirt and transform it into some nice garden soil. 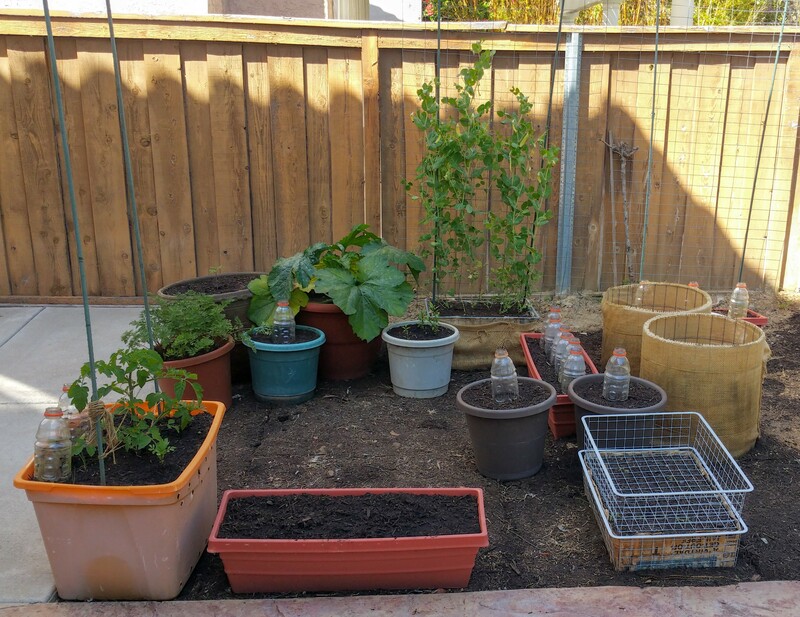 This space, meanwhile, is home to various planters filled with a mixture of (free) compost, yard dirt, blood meal, bone meal, egg shells, coffee grounds and orange peels. 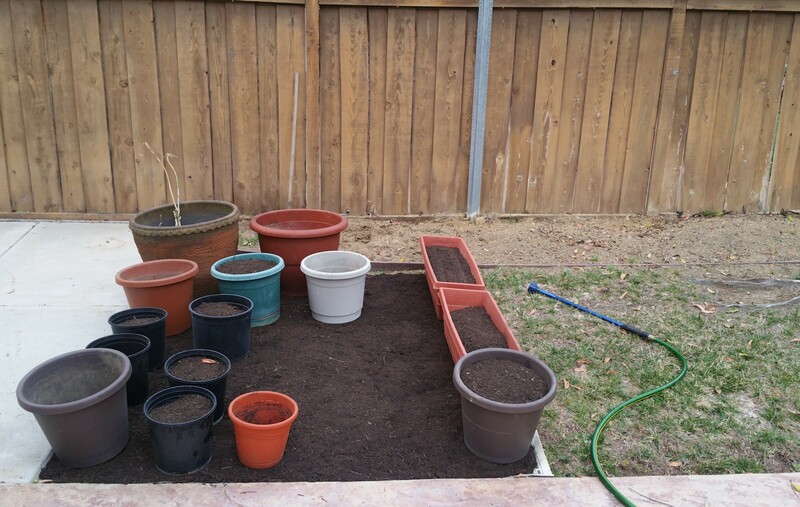 This was the first iteration of the planter arrangement. It’s changed several times until I settled on the arrangement shown in the first picture. I’ll be adding more plants, so my setup is still evolving. 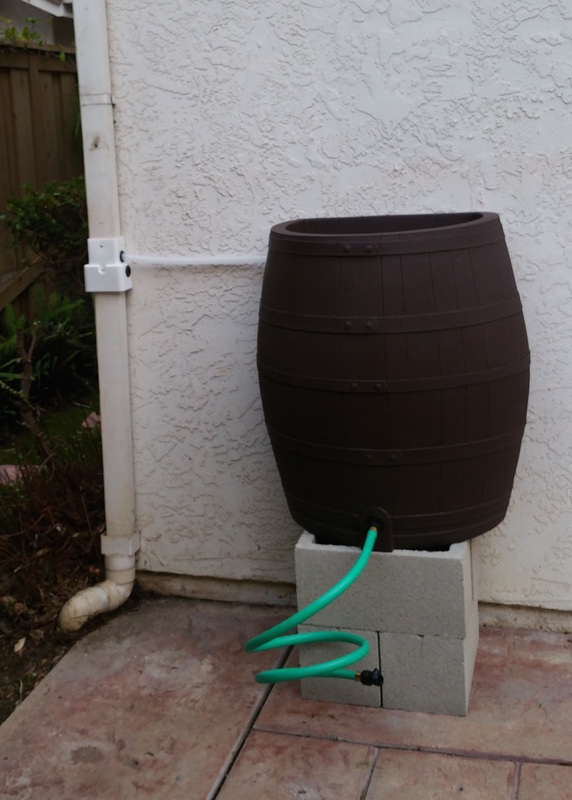 This is a Rescue 50 gallon rain barrel with diverter propped up on four 8″ x 8″ x 16″ concrete blocks. The product came with detailed instructions to install everything. We put a second barrel next to another downspout at the opposite side of the house. We got to test this setup thanks to a light to moderate rain today. Even just a light to moderate drizzle filled up both of these barrels within a few hours. We could even hear the excess water being diverted back into the downspouts after the barrels were full. Now I just need some vegetable plants to water.